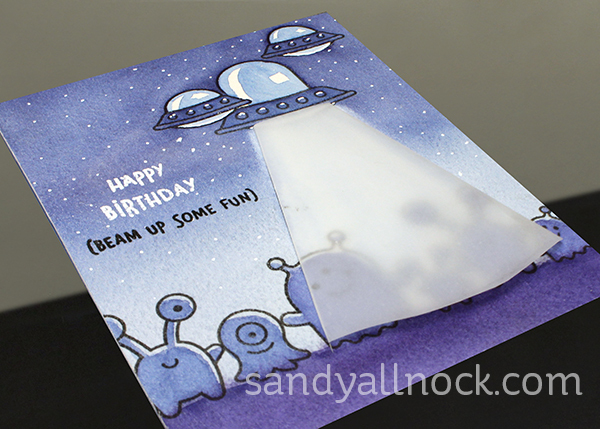 There are lots of ways to create a “beam” from an alien ship using Lawn Fawn’s Beam Me Up stamp set…I nearly made an interactive beam-up action, but realized there are lots of folks on YT who will do that. 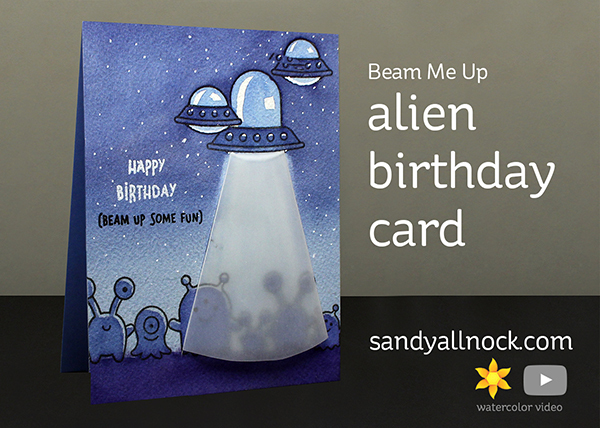 I always look for something out of the box to try – so creating a physical beam, popping up off the card, seemed like fun to try in my alien birthday card! In the movies the figures under the beam end up all blown-out with light, so the vellum look lends toward that too. I did some watercoloring but you could color this with any medium! Watch the video below or click HERE to see it in HD on YouTube. Absolutely out of this world, fabulous effect with the vellum, I was won over with the babywipe effect let alone the vellum. Great video again.Thanks. Well done, Sandy. Thanks for the video. Love listening to your voice. This is such a cool technique. Thanks for sharing your secrets. Oh wow, this is just adorable! Funnily enough I have this stamp set out on my desk right now! And the slits keep adhesive from showing through- genius! Great card Sandy, I love the beam from vellum that was an amazing idea. Thank you so much for sharing. I love this card! I have a thing about aliens & monsters so it’s right up my alley! This would also make a darling light-up card. Get outta town! What an outrageously fun scene and card! I love your use of vellum as the spaceship beam of light! Funny cards are right up my planetary alley! Keep rocking our socks off, Sandy!! As always, you have a way of starting my day off with a smile and a chuckle. Your alien monsters are pretty cute, and the “beam” is a great idea. But you scared me for a second when you started cutting into those cute little guys! I’m glad the surgery was a success – let’s hear it for Doc Allnock!!! You do the most amazing cards! Wish I had 1/10 your talent! Thank you for sharing!